JUNE 2016. After her recent debut with the Berliner Philharmoniker during their Asian tour (Beethoven’s 9th) and unforgettable concert in Berlin with the Rundfunk-Sinfonieorchester last year (Verdi’s Requiem) the Polish soprano will return to the German capital this June. Iwona Sobotka will take part in an educational project of the Berlin Philharmonic performing the part of the Queen in The Two Fiddlers opera by Peter Maxwell Davies. 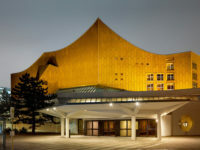 Apart from the Berlin Philharmonic’s musicians, the project involves soloists, choir members and young musicians, all under the guidance of Sir Simon Rattle, the artistic director of the orchestra. The concerts will take place on June the 18th and 19th. The event will be broadcasted by the DIGITAL CONCERT HALL platform. Earlier, on June the 4th, the Polish soprano will perform in a charity concert to benefit Jacek Janiszewski, a Polish opera singer whose brilliant career has been broken up by a critical illness.